If you are a Bible Fellowship teacher, part of a Bible Fellowship teaching team, or even thinking about teaching, you will not want to miss this training opportunity to learn from two world class seminary professors! I am looking forward to having these two professors come and open God’s word with us. Dr. David Black is Professor of New Testament and Greek at Southeastern Baptist Theological Seminary in Wake Forest, NC. He holds the D.Theol. in New Testament from the University of Basel (Switzerland) and has done additional studies in Germany and Israel. 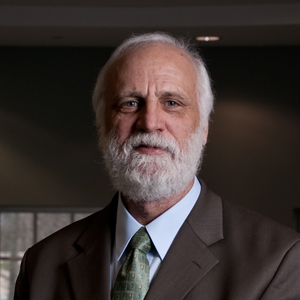 Dr. Black is considered a leading authority on linguistics and New Testament Interpretation. He has written over 100 articles and authored or edited over 20 books. Dr. Black is well known for his passion in teaching (watch here). 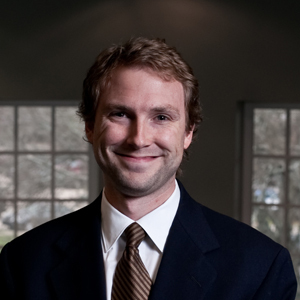 Dr. Heath Thomas is Assistant Professor of Old Testament and Hebrew at Southeastern Baptist Theological Seminary in Wake Forest, NC. He earned a Ph.D. in Old Testament from the University of Gloucestershire in Cheltenham (United Kingdom) and has also done studies at Oxford University. 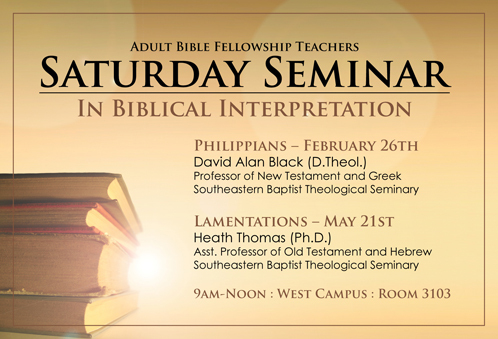 Dr. Heath Thomas has recently published a commentary on The Message and Meaning of the Book of Lamentations. I’ve been asked to do a 3-hour teachers’ workshop on Saturday, February 26, at Calvary Baptist Church in Winston-Salem, NC. What fun that will be! My assignment is to walk the teachers through the book of Philippians, which they will be teaching in their classes beginning in March. Exegeting a New Testament epistle is like working on a giant jigsaw puzzle of an ancient walled city in Europe. Just when you think you’ve figured out how to put together the walls, the ramparts, the towers, and the homes you encounter a blue, cloudless sky. The cry, “I got it”, is the final act of triumph. I’ll never forget the day I completed my essay on the discourse structure of Philippians (later published in Novum Testamentum). It was one of those “ah-ha!” moments the likes of which I shall never forget. I suspect that those who believe that “joy” is the theme of this New Testament book will be sorely disappointed with my essay. But as I read the epistle, I was forced to conclude that joy is at best the byproduct of something much more important. I have said that this invitation is from a local church that is preparing its teachers to teach well and accurately. I cannot think of a better way to integrate seminary and church. Nor can I think of a single faculty member at SEBTS who would not be willing to place his or her expertise in the service of the church in such fashion. We look forward to having both of you here! You can read an interview that Dr. Black did with Dr. Thomas here. Matt – Will the presentations be recorded and/or posted somewhere? I’ve been preaching thru Philippians for over a year and have been using Dr Black’s discourse structure as my basic outline. Actually being able to hear him speak on the subject would be phenomenal. Can’t attend since I live in Berlin, Germany.